ArenaNet has announced that the Guild Wars 2 expansion Heart of Thorns will be out on October 23. 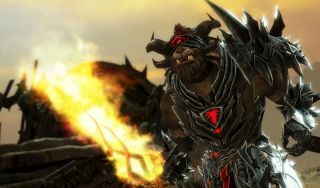 The expansion will be released as a "buy-to-play experience," with no further subscription fees once purchased—because, in case you missed it, Guild Wars 2 is now free. "We're making the base game free because we're confident that anyone who loves Guild Wars 2 will consider buying Heart of Thorns, continuing their experience into the expansion and beyond with Living World and our newly announced raids," ArenaNet President Mike O'Brien said in a statement. Raids won't be live when Heart of Thorns launches, but will be rolled out shortly thereafter. We spoke with Guild Wars 2 Game Director Colin Johanson about raids and how ArenaNet plans to adopt them to suit the game's competitive PvP model. "I think we actually have a really great advantage here in that I think the combat system is one of the most unique parts of Guild Wars 2," he told us. "Our raids take all the things that our combat system offers, brings them all together, and asks you to use all of those abilities together to defeat everything." Read the full interview right here.